In the previous post, we introduced Candy Kid: a simple maze chase video game re-written in XNA 4.0. 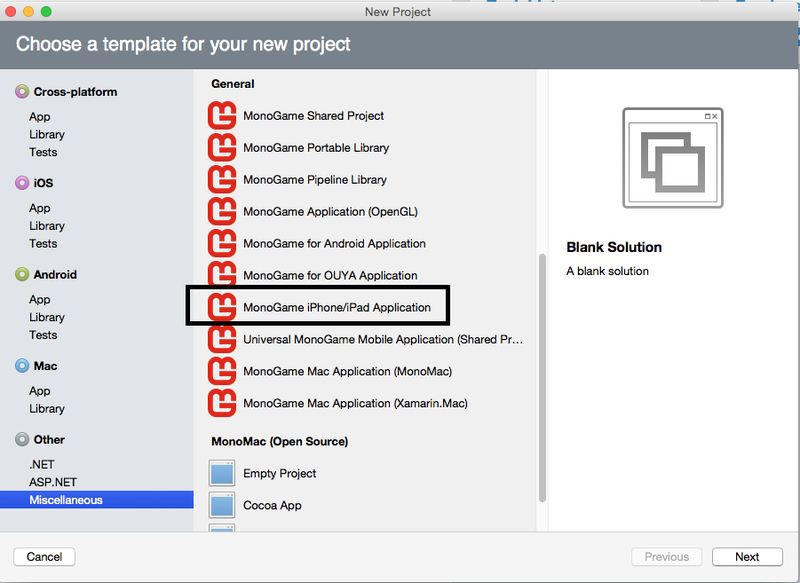 We outlined the tasks to port Candy Kid to Android platform using MonoGame. Now we will focus on iOS. This post assumes you have Mac OS/X and XCode installed. Also, that you have an Apple Developer account and relevant Certificate(s) and Provisioning Profiles installed to deploy code to iOS devices. Download and install MonoGame for MacOS. Here is tutorial to create cross platform MonoGame. 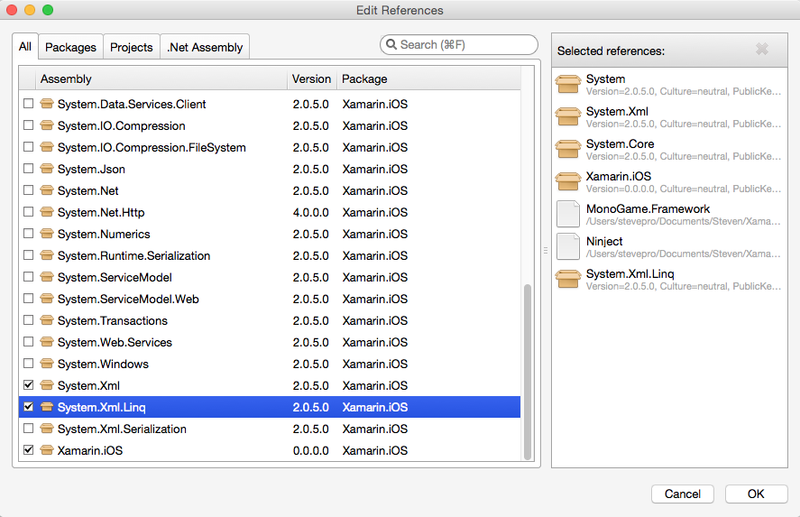 Download and install Xamarin Studio. Setup an account; a trial version can be used just to get started! Launch Xamarin Studio | Click Login. Enter your email + password and click the "Create Account" link. From here you will be prompted to create a Xamarin account: enter name, email address and password. 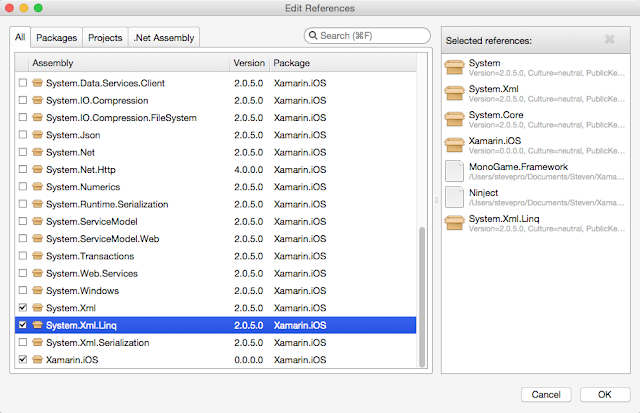 Check "Start 30-day Xamarin trial immediately". Click Accept. Log in to Xamarin Studio to activate a/c. Choose File menu | New | Solution. Expand Other | Miscellaneous | MonoGame iPhone/iPad Application. Right click CandyKid.iOS project | Options | Build | iOS Bundle Signing. Remove "Entitlements.plist"
Right click CandyKid.iOS project | Options | Build | iOS Application. Change Deployment Target to 5.2. Rebuild solution fine. Attach iOS device. Click Play button. The default template code should deploy ok.
Candy Kid references the following libraries: Ninject for IoC Container and Xml.Linq for Serialization. Right click References | Edit References... "All" tab | Scroll to bottom. Check "System.Xml.Linq". OK. Right click Packages folder. Right click "MonoGame.Framework.iOS" node. Choose Update as necessary. Update: at the time of this writing the latest MonoGame.Framework.iOS package is version 3.4.0.459. However, if you would like to target iOS 9.0 then you can manually download version 3.5.0.628 here. Right click Packages folder | Add Packages... Enter "Portable Ninject" into Search bar on top right. 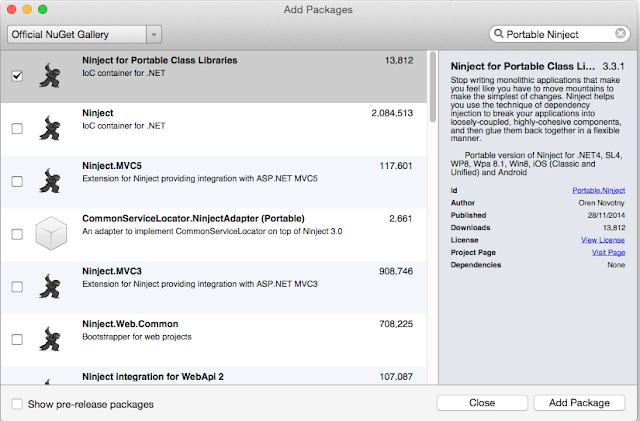 Select "Ninject for Portable Class Libraries" | Add Package. Portable Ninject reference also added. Also, update AssemblyInfo.cs file under Properties folder. Synchronize "1.0.0" as the AssemblyVersion. Repeat all settings for both Debug and Release build configurations! // Option #1. P/Invoke exit(). // Option #3. Throw an exception. 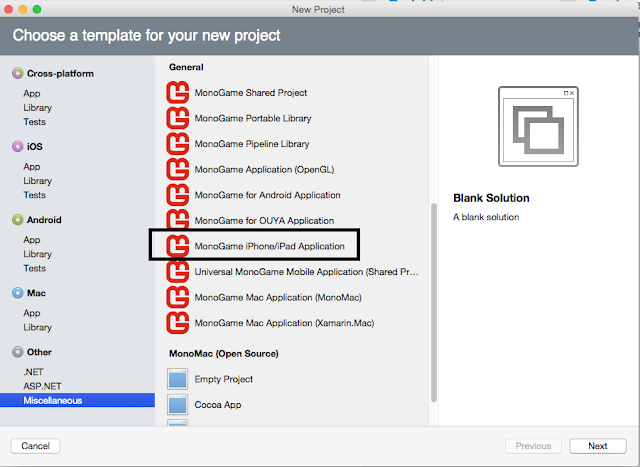 MonoGame iPhone/iPad Application templates add a "Content" folder as default location for all Content. Song source MP3 files can usually be used as original format; should not need be rebuilt for Mac OS/X. Note: there may be issues MP3 songs on low-end devices: MediaPlayer API may cause game to crash! Alternative: replace MediaPlayer(Song) with SoundEffectInstance, however XNB file will be much larger! Copy all source texture images, for example: BMP, JPG, PNG files from the original XNA game project. Update all relevant Universal Icons, Launch Images and iTunes Artwork for iOS device compatibility. Important: if Retina (4.0-inch) launch image is not set then iPhone 5 resolution will not be supported! Choose Finder | Applications | Pipeline. MonoGame Pipeline launches. Choose File | New. Save project. Right click project | Add | Existing Item. Add an existing content file e.g. Emulogic.spritefont | Open. Right click file | Rebuild. An exception may be thrown but the XNB file is still available in bin folder. Right click project | Add | Existing Item. Add an existing content file e.g. Celebrate.wav file | Open. Right click file | Rebuild. Assuming Pipeline is installed correctly, the XNB file available in bin folder. When using MonoGame Pipeline tool, you may receive Access Denied error, especially with MP3 files. This may be because the ffmpeg binary (and ffprobe binary) needs executable permissions to be set. Attach iOS device to Mac OS/X. 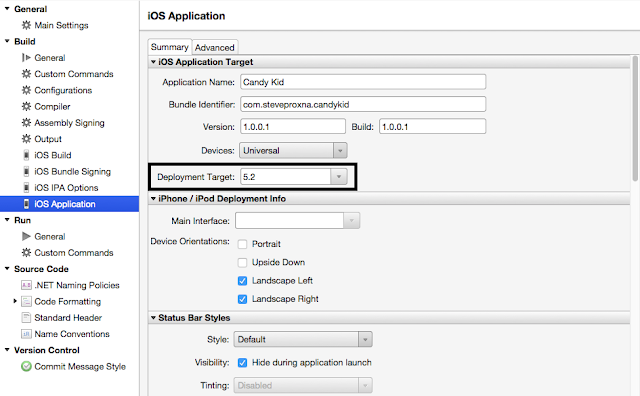 Xamarin Studio, click arrow next to build configuration | Select device. Click Play button. iOS device launches game as "Evaluation Software". Build will expire within 24 hours. Alternative: right click CandyKid.iOS project | Archive for Publishing. Click Sign and Distribute button. Select iOS Distribution Channel as "AdHoc" | Next. Select Signing Identity and Provisioning Profile. Choose Next to Publish as Ad Hoc. Click Publish button. Choose Location | Save. Now reveal in Finder. Double click IPA binary file. iTunes launches ok. Select device | Apps | Candy Kid. Click Install | Apply. 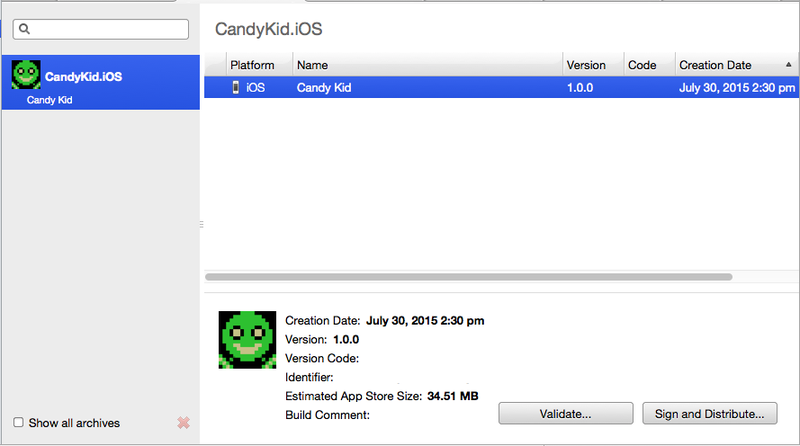 That concludes the Candy Kid port to iOS platform. Outstanding: Candy Kid published on iOS / Android!